The 20th of November is an important day. It is not one that most people think about but it is important. 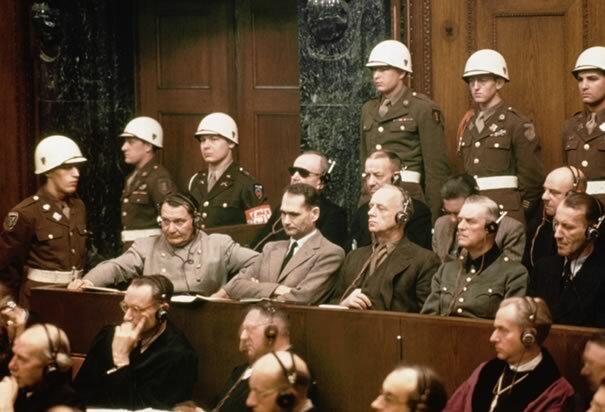 It was the day that the major war criminals of the Nazi Regime were put on trial at Nuremberg. That was the most dramatic of the trials, but later trials were held on those that ran parts of the Nazi regime, the senior and mid-level executioners of Nazi policy. Those men included civil servants, jurists, physicians, military and police officials especially leaders of the Einsatzgruppen. I studied Weimar and Nazi Germany as well as the Holocaust under Dr. Helmut Heussler at California State University at Northridge as an undergraduate and in a year of graduate studies. I also continued that study while in Seminary as well as in my Masters Degree in Military History. I was stationed in Germany several times, done an exchange tour with the German Army and my German friends say that I am fluent in German. I have been to Nuremberg, Dachau and Bergen-Belsen. I have stood on the reviewing stand where Adolf Hitler preached to the multitudes of assembled party faithful on the Zepplinfeld in Nuremberg. As such I am a realist about the unique horror of the Holocaust. I am a realist about people and how and the circumstances of the times brought ordinary people, men and women to either commit, support or simply turn their backs on the greatest atrocities ever committed by a “civilized” Western nation. A nation steeped in the traditions of Christendom and the Enlightenment. As a Priest, Historian, Military Officer and Ethicist I often find that I return to my old books used in my various degree programs as well as as the resources of museums and universities now available on the internet. I also watch films about the era. Not war films, films about the ordinary men that carried out these crimes either by pulling the trigger, pushing a button, signing an order or simply turning their backs and remaining silent. I think that is what makes them so compelling. Three of those films I watch at lest once a year, sometimes multiple times. One is Conspiracy starring Kenneth Branagh which is about the Wansee Conference where mid-level officials and bureaucrats met to has out details of the Final Solution. The second is Nuremberg starring Alec Baldwin and Christopher Plummer which is about the major war crimes trials. 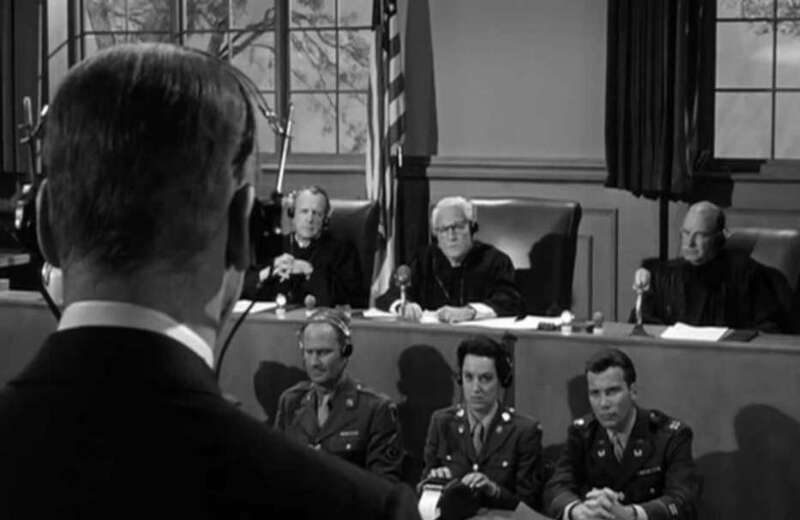 The last is the classic Judgement at Nuremberg starring Spencer Tracy and Burt Lancaster. It is that film that I have concentrated on today because it deals with men who executed the laws enacted by the Nazi regime, many of whom who before the Nazi seizure of power were perfectly respectable in their dealings with Jews and others that the Nazis would persecute. That is the chilling thing about this period of history and these films. The show ordinary men who for a variety of reasons chose to violate their own conscience as well as the norms of what they knew was right. They did so often out of fear, fear of change, fear of others and even fear of themselves. The fact that otherwise decent people not only followed Hitler but willingly executed Nazi policies against their former neighbors, colleagues and friends is the most chilling aspect of all. I say this because the people are so ordinary yet perpetrated such evil. 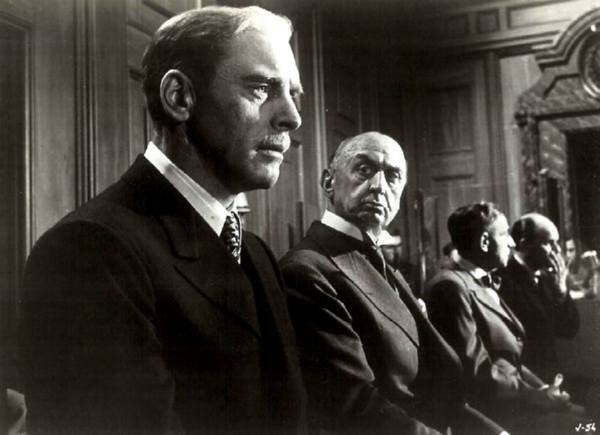 In Judgement at Nuremberg Burt Lancaster plays a jurist who served the Nazi regime, a jurist who before the Nazis was considered to be one of the best legal minds not only in Germany but in Europe. In the film the character played by Lancaster, Ernst Janning discussed who he and others like him ended up doing what they did. It is a penetrating look at how people justified their actions. 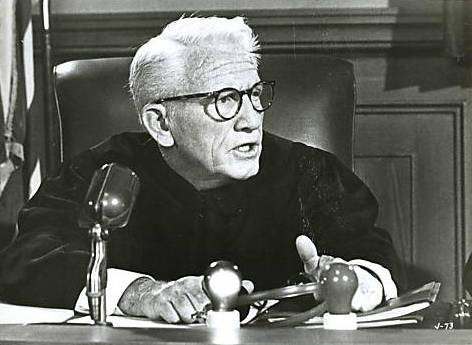 At the end of the movie Judgement at Nuremberg Spencer Tracy as Presiding Judge Dan Haywood concluded his sentencing remarks with this statement. It is perhaps one of the most powerful statement and something to remember as the Unholy Trinity of Politicians, Pundits and Preachers urge us to hate one another and those different than us. It is something that is especially needed in times of great societal stress as well as real and perceived dangers from without and within. “Janning, to be sure, is a tragic figure. We believe he loathed the evil he did. But compassion for the present torture of his soul must not beget forgetfulness of the torture and the death of millions by the Government of which he was a part. Janning’s record and his fate illuminate the most shattering truth that has emerged from this trial: If he and all of the other defendants had been degraded perverts, if all of the leaders of the Third Reich had been sadistic monsters and maniacs, then these events would have no more moral significance than an earthquake, or any other natural catastrophe. This is an unsettling subject and people on the political right and left in this country are apt to compare their opponents to those that were tried at Nuremberg and those that led them. This has been an increasingly disturbing trend in the case of hyper-partisan Right Wing so called “Evangelical Christians” who blatantly demonize those who they hate and urge the use of the police powers of the state to enforce their political-religious agenda. However it is possible that any party in society when divided by fear, hate and the desire for power can behave just as the industrialists, financiers, doctors, soldiers, jurists, civil servants, pastors and educators who oversaw those heinous crimes. Those tried at Nuremberg were all people that should have known better, as should we.